Full Introduction for "VOJNA I MIR"
Hello, I am Jan-Hein Bal from the Netherlands and associated with the EYE filmmuseum in Amsterdam. EYE is the Dutch national film archive, and a major 70mm exhibitor. Their "The Hateful Eight" 70mm print had a world record of 37.000 visitors in 2016 and in 2017 their best visited films were the 70mm prints "Dunkirk" and "2OO1: A Space Odyssey". Now they show "Phantom Thread", "Lawrence of Arabia" and again "2OO1" in 70mm. I was also an art cinema projectionist, author of the Amsterdam 70mm cinema website, wrote articles on European and Asian 70mm in a book sold here, and now I write the book "Red Widescreen" on Soviet 70mm history. I like "War and Peace" and will introduce it briefly. The first Russian film of WAR AND PEACE is from 1915. In the 1950s new widescreen technologies appeared including 70mm film. American producer Michael Todd visited Moscow in 1957 with a Mitchell 65mm camera and Philips 70mm projector. 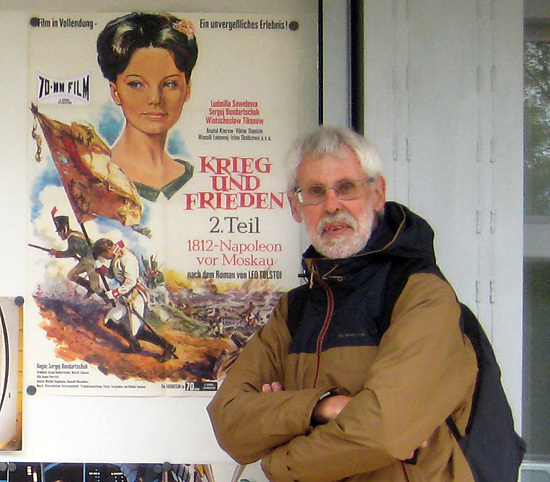 He proposed a joint 70mm production of WAR AND PEACE which was rejected but the equipment remained and was used for the Soviet own 70mm widescreen technology, starting with FLAMING YEARS in 1961, not on 65 but 70mm negative. Outside the Soviet Union were produced about 80 70mm features (excluding Imax and blowups). The Soviet Union however had the world’s largest 70mm production with about 175 features (excluding another 175 blowups), besides the most 70mm cinemas, and the most successful with billions of visitors each year. The number of Soviet cinemas which could also screen 70mm increased from 87 in 1965, to almost 1500 in 1979. After the western 70mm decline since RYAN’S DAUGHTER from 1970, Soviet 70mm production continued until 1989 and Russian Stereo-70 even until 2003. 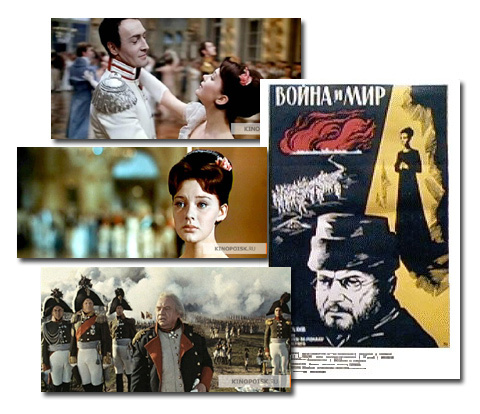 Well known Soviet 70mm features include ANNA KARENINA, BROTHERS KARAMAZOV, CHAIKOVSKY, LIBERATION (coproduced with Barrandov) and DERSU UZALA which received an American Academy Award just as the most famous film WAR AND PEACE. This was released in four parts between 1965-1967 and is the most ambitious, expensive and successful Soviet 70mm film. Production took over five years. Candidate for direction was Ivan Pyryev but the Minister of Culture finally choose Sergei Bondarchuk, famous for his moving WW2 drama DESTINY OF A MAN. Besides directing WAR AND PEACE he also acted the demanding part of Pierre Bezukhov himself though he was much too old. Various actors were considered for Prince Bolkonsky, including Innokenty Smoktunovsky but after protest by Grigori Kozintsev (preparing HAMLET) it became Vyacheslav Tikhonov who got so disappointed that he almost retired. For the character of Natasha after a huge talent search Bondarchuk choose the unkown young ballerina Ludmila Savelyeva, who in 1962 was 20 while Bondarchuk was already 42. Vladislav Strzhelchik was Napoleon without dialogue. According to financial statements the budget was over 8 million rubles or in dollars over 9 million but this excludes huge support from the Ministry of Defense. Other figures are unreliable. The Soviet press claimed the budget as 18 to 25 million rubles. The Russian website Kinopoisk mentions 29 million dollar, the western press 100 million dollar, and the Russian website Cinemafirst 150-250 million dollar. It was produced by Mosfilm with location shooting all over Russia including Moscow, Leningrad, Smolensk, Suzdal etc, besides Ukraine battle shots and Romanian summer scenes. Over 100 outdoor sets were constructed (including streets of St. Petersburg, Moscow, and battlefields) and over 100 indoor sets, including a huge ballroom. Props were borrowed from over 40 museums. Bondarchuk insisted on absolute authenticity which claimed extra time and budget. The first cinematographers were husband and wife Alexander Shelenkov and Chen Yu-Lan but they clashed with the unorganized and dictatorial Bondarchuk and were replaced by assistant Anatoli Petritsky as DOP. They used 70mm Soviet color negative, both for budget reasons and for national pride but Petritsky considered it of terrible quality. Bondarchuk re-shot over 10% because of film stock and some weather problems, which raised the budget with 10-15%. Actually they started shooting in both 70 and 35mm but the last was soon abandoned. 70mm Weekend 2018 Varnsdorf: on one of the largest screens in Europe. 70MM in Varnsdorf - a new hope? They pioneered with camera techniques never used before in the Soviet cinema including a cable car of 120 meter. For Natasha's first ball, the operator used a heavy hand-held camera and roller skates, also watch the flying camera overhead. For the crowd scenes they used cranes, towers and helicopters. Also new was a six-channel sound recording system. Sometimes they travelled with 150 wagons of equipment. The Borodino battle was the largest Soviet shoot ever during three months. Shooting started August 1963 with 1.500 army horsemen and maybe over 13.000 soldiers. The Western press mentioned 120.000 soldiers but in 1986 Bondarchuk stated that it was exaggerated ten times. From December 1963 to June 1964, they worked in the Mosfilm studios including Natasha's first ball with 500 extras. July 1964 Bondarchuk was ordered to abandon all other work and finish the first two parts for screening at the 1965 Moscow Film Festival. Soon he had a heart attack and was briefly clinically dead which happened again. If he died he wanted Sergei Gerasimov to continue. In 1965 the Kremlin Congress Palace had a closed premiere of parts 1-2 for representatives of the State Committee. The 70mm version of part 1 was released in the Moscow Rossiya cinema in 1966. The fourth and final part was released in 1967. Part 1 shown here had over 2800 Soviet prints, including 89 70mm prints, over 600 anamorphic prints, over 1000 non-anamorphic 35mm prints, and over 1000 16mm prints. The number of 70mm prints for other parts were 93, 74 and 75. It was a huge success with about 135 million Soviet visitors and earning 58 million rubles. Part 1 had over 58 million Soviet visitors, part 2 over 36 million, and the last two about 20 million each. It was screened in 117 countries with over 1 million visitors in France, over 2 million in the German Democratic Republic, and sold over 5 million tickets in Poland. The American dubbing was considered a disaster. 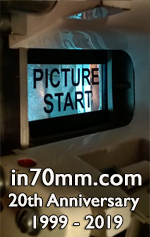 Despite the Oscar the only (dubbed and abridged) American 70mm print was hardly shown and is now lost. In 2000 it was restored in Russia but using 35mm prints as all 70 and 35mm negatives were already lost. Bondarchuk never shot again in 70mm but all his next four 35mm films were blown up to 70mm like WATERLOO, a kind of sequel. WAR AND PEACE is a movie which ages well as it improves with every viewing. I first saw it in 1970 in a Dutch local 35mm cinema, abridged for western release from over 8 to 6 hours. I was totally unprepared for such a heavy and slow Soviet story, with unattractive color and uneasy music. After an ugly videotape I saw in 2009 the full version on DVD and with a terrific documentary making of, it really opened my eyes. A thoughtful, respectful, moving masterpiece, with many stunning tracking shots and giant crane shots, exciting locations and sets, impressive score and editing, the perfect preparation to enjoy finally a 70mm screening in 2013 in the Amsterdam Filmmuseum. The vintage print was beyond all my expectations, terrific images with absolutely stunning close-ups. This time I especially noticed the unusual freeze-frames, split screen and an extreme range of sound volume, from very loud choirs to dialogue which was almost too soft for any Russians in the back seats. And the shade of a camera during a nightly tracking shot never noticed before. Director King Vidor whose American version sold over 31 million Soviet tickets considered the Moscow fire beautifully shot and the Borodino battle unsurpassed. It was praised by the Brezhnev government. Despite its Soviet patriotism it is one of the most impressive Soviet 70mm films, not only because of all the exciting spectacle and battles but also and maybe more as a very human antiwar film and Bondarchuk is most impressive with his humble acting just as in DESTINY OF A MAN. Today you see only part 1 but I hope you will have similar experiences or are better prepared than I for your first time. For questions or discussion about WAR AND PEACE you can speak me anytime in the bar or elswhere during the festival. Thank you.